London city council will hold a special meeting next month to debate which local transit projects will be used to apply for $374 million in infrastructure money from senior levels of government. London city council will hold a special meeting next month to debate which local transit projects will go into an application for $374 million in infrastructure money from senior levels of government. Mayor Ed Holder told the civic works committee Tuesday that council has a limited time to apply for the money, which includes $204 million from the federal government and $170 million from the province. Holder pointed out "time is of the essence," with a federal election coming in October. Staff will present a number of different projects that would fit the parameters of the funding program. Staff have said the applications may include elements of London's proposed $500 million bus rapid transit (BRT) plan, but may also include other local transit projects. The decision will happen the week of March 18 with council sitting as the strategic priorities and policy committee. The meeting will also include a public participation portion so members of the public can weigh in. But with this council appearing to be divided on BRT, a big question will be whether council can agree on which projects should go into the application in time for the federal government deadline. Committee chair Coun. Phil Squire tried to keep Tuesday's discussion, which was essentially about setting a meeting, from tumbling down a rabbit hole of debates about specific transit projects. Civic works voted 5-1 — Coun. Elizabeth Peloza opposed — to recommend that staff bring forward a list of transit projects to the March meeting. Lewis asks staff what other items might be on the list. Squire, who’s chairing this meeting, is trying to move things along and keep committee focused on this vote. City engineer Kelly Scherr says a number of projects are ready and can draw from existing plans. 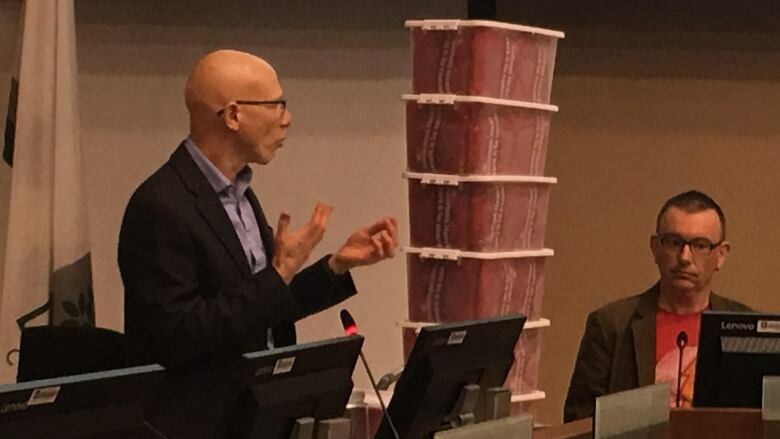 The previous council was unable to deal with a referral on the issue, so it was up to London's medical officer of health Dr. Chris Mackie to speak in its favour Tuesday. He said fluoridation helps prevent tooth decay but its opponents, including a handful who spoke at Tuesday's meeting, say its use is harmful and its benefit is unproven. "We saw a 50 per cent increase in cavities a few years after water fluoridation was discontinued," said Mackie. "Each time water fluoridation is discontinued, you see an epidemic of children's cavities coming into a community," he added. "I've been closely watching water fluoridation for the past decade and you do see that literature is becoming stronger and stronger each year," he said. "The claims of health risks are not supported by science." She described fluoride as a "toxic waste product" and said putting it in the city's water is a violation of the Charter of Rights and Freedoms. ​There were a few strange moments during the discussion about fluoride, two of them from Coun. Michael van Holst. Van Holst also spoke about his skepticism about the safety and effectiveness of fluoride, based on studies he'd seen produced in other countries. "I have a fear that fluoridation is going to turn out to be the Bill Cosby of water treatment processes because it's something that we have thought was irreproachable but maybe behind the scenes, it's actually doing great harm." "I almost jumped in on that comment about Bill Cosby," he said to van Holst. "I'm not sure that's appropriate ... but we'll leave it at that."